Oh shoot! Consequences? I had completely forgotten about consequences. What I wanted to tell her, but wisely didn’t, was when the boys got too wild or broke a rule, their “consequence” was an angry mommy… or the command, “STOP IT!!! !” or choice words yelled across the house. Feeding a newborn every couple hours made it challenging to remember the importance of an effective discipline system. Meeting the needs of a baby was all-consuming. Providing for physical needs of 3 other boys, then possibly meeting some emotional needs AND executing thoughtful discipline on top of it all? Forget about it. But her question, “What is the consequence…” stuck in my head for several days. She reminded me how off-base my discipline had tilted. Maybe it had just fallen off the wagon all-together. For me, discipline swings on a pendulum swinging between too-strict and too-permissive. When things get too permissive, it gets too chaotic in our home and it robs the joy. James Dobson gives a memorable analogy (this is my summary…) Suppose you are going 90 mph on the highway and pass a police officer. What if the officer could only stand next to the highway and yell as loud as he could, “Slow down! 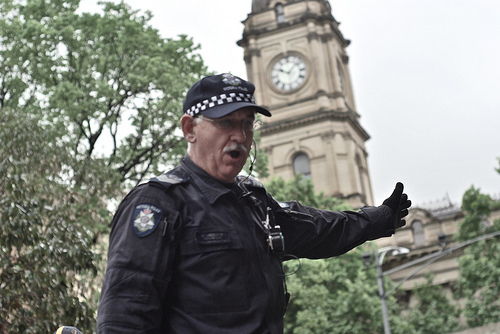 !” & blow his whistle…would you stop speeding? But imagine driving with your kids, jamming to your Seeds Family Worship and you see the lights of a police car in your rearview mirror (not that this has happened to me…merely an example). 😉 Your heart beats rapidly as you roll down the window to hand over your license & registration. You wait anxiously for the officer to return to the side of your car and determine whether you will be handed the dreaded ticket requiring you to pay a large sum of money. For the next month…or year…when you get to the specific road you were pulled over, you make sure to go well below the speed limit. And it worked…behavior changed by a consequence. For a long time I’ve been the police officer just yelling from the side of the road. My kids called my bluff & there was no change in behavior. 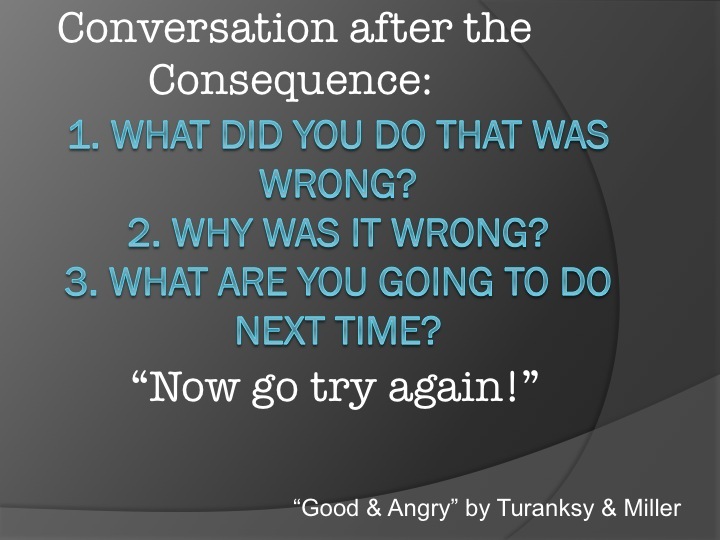 Then I was flipping through the book “Good & Angry” by Turansky & Miller and was reminded of a simple way to deal with misbehavior at home. It gave me a plan to implement in those moments I want to just shout “no!”. What did you do that was wrong? What are you going to do next time? **End with “Now go try again!” (my favorite part…they leave encouraged instead of discouraged). I’m not going to lie & tell you life is grand & my boys never fight or disobey. No ma’am. But I have a plan now. When the baby needs to be fed & someone makes a bad choice I have a tool I can pull out instead of yelling. What consequence system have you found to be useful? I can use all the help I can get!! I currently have a 3 month old and I am in the “feeding every 2 hours” stage of life right now. I have noticed my yelling has increased a lot over the past few months. I must sound like a crazy person to my 2 year old and my 4 year old. I really appreciate your post today because it helps me remember need a plan for those times when I can’t jump up and intervene. such a tricky stage of mothering…they know you “can’t” follow through (well, I guess you could…it would just make one baby VERY upset…adding to the chaos). Let me know if this plan works for you! I totally relate to your pendulum swing – from too strict to too permissive. Finding balance can be hard! Thanks for the post – it was a good reminder. always glad to hear when I’m not alone in these things…thanks, Laura!! Ha! I’m picturing the look on your 18 month old’s face. Yeah I would def say it has the greatest affect on those in my home 3 years and older. From the speech-language pathology perspective…”Why” questions are tricky for little guys. (pst…congrats on the 3rd boy!). Ooohh, I like this. I shall give this a try! We do: 1. Why are you in time out/why did you get a spanking (depending on the offense). 2. What do you need to say (sorry for ___) and 3. mommy forgives you. It works (kinda) but I like the better exploration of the event with your plan. Think I will still work on putting the sorry in there. Oh yes!! thanks for the reminder Pamela. Definitely should have a “how are you going to make things right?” part of the conversation. Especially if misbehavior caused pain for another member of the family. Let me know if it works for y’all. Again…just another tool in the bag. you talk about making them sit on the naughty step. How do you make a 13 year old do that I ask? I have a 13 yo son, and usually if he’s being disrespectful to me or ugly to his siblings I send him to his “man cave” for a bit. (He has a loft bed, with a sheet hanging down to close off the part underneath for privacy, as he shares his room with two other brothers.) Usually he just needs some time to calm down, and then we can talk things through.